Sargeant Bay Provincial Park is located in the Halfmoon Bay area of the Sunshine Coast. The park itself consists of a large, crescent shaped beach, a wetland area, and then on the northern end a large forested area with trails leading up to Triangle Lake. Head on down towards the beach where you’ll see the raised berm that separates the wetland and the beach and you’ll find a trail here. One of my favourite things about the park is that even on a beautiful summer weekend, you will likely have lots of space to yourself to soak in your surroundings. The trail is wide and easily accessible and lined with beautiful dogwood flower, with views of the wetland on the northwest side and the beach on the other. 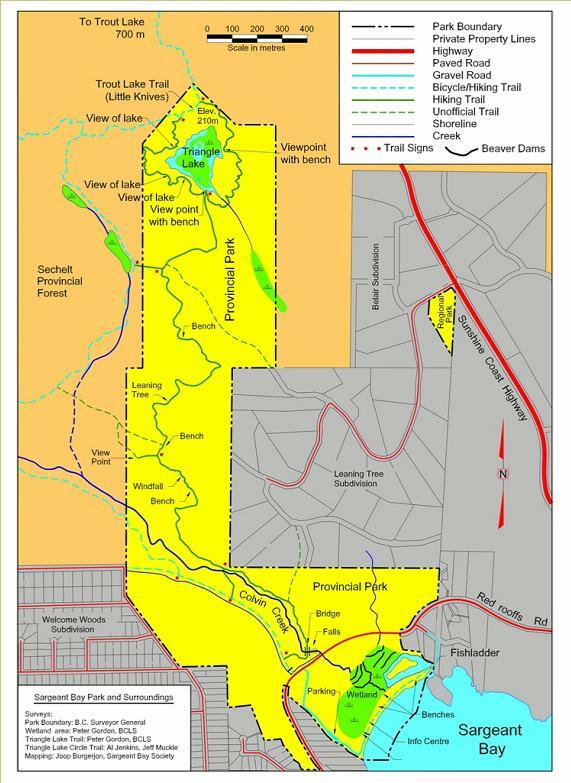 Map of Sargeant Bay Provincial Park. The trail is just a short 0.5 km walk, but the prime scenery makes it more than worthwhile. As you walk along the trail you’ll be flooded with birds chirping, with more than 157 unique species that have been seen in the park. The wetland and Colvin Creek open into the bay at the far end of the trail where multiple conservation projects have been completed to help protect the salmon spawning and beaver habitats in the area. Be sure to take some time on the beach as well. The giant driftwood logs lining the pebble beach are pretty spectacular, let alone the pristine view out to the Trail Islands and Sechelt. At low tide you’ll find some great sections of sandy beach, too. From Sechelt, follow Highway 101 7 km north into the community of Halfmoon Bay. Take a left onto Redrooffs Road and the turn off for the park is well marked on your left side.